In previous posts I hinted at an aviation adventure that I was planning and on Friday I finally pulled it off. Here is the full story. 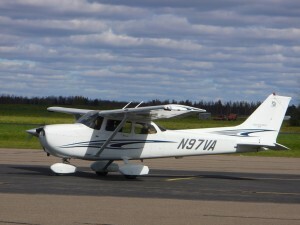 Up to Friday, I had not flown since July of 2009 so I need a flight review and some CFI coaching too. Rather than just go out to fly some maneuvers and do a few takeoffs and landings, I decided I would use the time to get checked out on the G1000 equipped Skyhawk at Skill. But, I also had another idea in mind that I wanted to combine with part of the flight review. When I got my license a few years ago, my mother told me that she always wished that she had taken flying lessons when she was younger. With her 78th birthday coming up in October, Georgia and I thought it might be fun for CFI Sandy and I to fly up to northern Wisconsin, where she lives, and let Sandy give her an actual first lesson. When I ran it by Sandy, she was all for it. I called Mom and asked her if she would be interested in going for a flight. She told me she was a little nervous about it but that she really would like to give it a try. So, the planning began. The first two dates we picked ended up being canceled because of gusty winds at the Rusk County Airport near Mom’s home. We wanted her to have a pleasant experience and winds of 15 knots gusting to 32 just didn’t fill the bill. The sky wasn’t as clear blue as it has been for a couple weeks but, on Friday, the surface winds were light up north so we decided to go. Sandy and I met at Waukegan a little before 8AM and checked the latest weather. We would have to stay lower than I had hoped but we could make the trip safely so I called Mom and told her we would be there about 11:30. I used Foreflight on my iPad to brief and file a VFR flight plan for a 9AM takeoff with 4500 feet as our cruise altitude. I preflighted the airplane and we pulled it out of the hanger so the fuel truck could fill the tanks. By now it was almost 9:00 so we got in and went through the pre-starting and pre-takeoff checks. When I turned on the avionics switches and tested the audio panel, we found out my headset was cutting in and out. Sandy called Skill on the radio and a spare headset was delivered to us on the ramp (thank you Deborah). Now able to communicate, we called ground and taxied to runway 32 for takeoff – 25 minutes late but, we were on the way. My mother, my sister and my sister’s boyfriend were waiting for us. 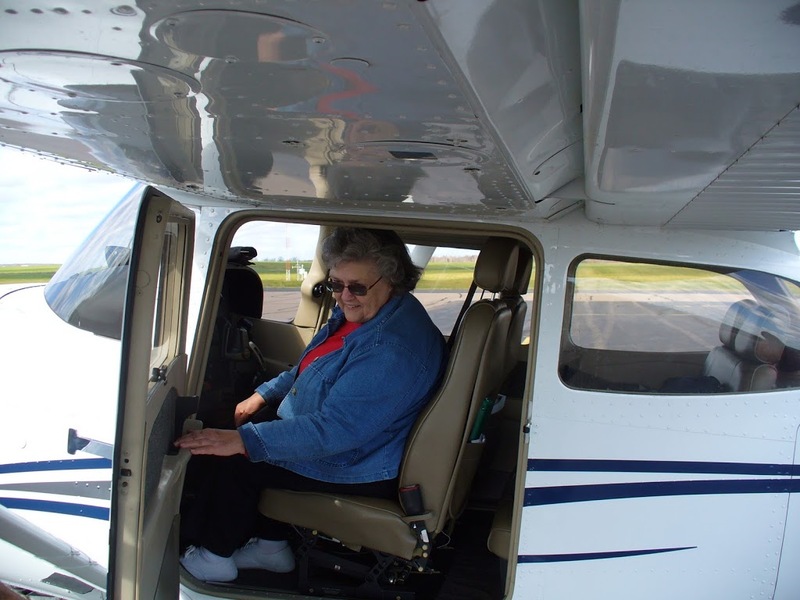 After introductions and a few minutes for Sandy to stretch her legs and talk about the up coming lesson, Mom got into the pilot seat. I helped her buckle in and got a few photos of the about to be pilot. Then we spectators moved back and watched as the engine started and the airplane taxied to the active runway. A few minutes later we heard the engine roar and the Skyhawk was quickly in the air. While we waited for Mom and Sandy to return, I looked over the RCX facilities. 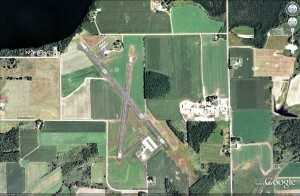 It is a great little airport. The runways are in very good shape and the pilot resources are first rate. Computers and phones are available for briefings and free WIFI is provided to connect your iPad or laptop. Fuel is self serve with a new credit card activated system. The whole place struck me as very well maintained and clean. An hour after they took off, we heard the Skyhawk and then saw it come over the field and enter the downwind for runway 14. Sandy taxied to the fuel pumps and shutdown. 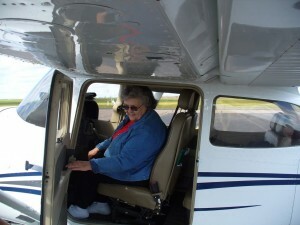 Mom had a big smile on her face and, as she got out, told us that she had really enjoyed the flight. Sandy and I worked together to refuel the airplane while Mom filled us in on the details. They had flown over her house and toured the area she was so familiar with from the ground. Sandy had her do the usual first lesson maneuvers of turns, climbs and descents and Mom was thrilled to have flown the aircraft on her own. Then, I handed her a log book I had purchased for her and Sandy logged her hour of instruction. It might be the only hour she ever gets but now she has that record of actually getting flight training. We drove to the nearby town of Glen Flora for lunch then back to the airport where Sandy and I preflightd the airplane and said our goodbyes. Mom thanked us both and told me that this was the best birthday gift Georgia and I could have given her. We climbed back into N97VA and took off for the trip home. This was a more leisurely flight with as much sightseeing as instruction. We did do some more practice with the G1000 and, again, I split the flying about equally with the autopilot. As we got close to Waukegan, Sandy had me load the RNAV (GPS) RWY 05 approach and fly a small part of it just to see how it is done. Ten miles out, I called the tower and they had us follow a Mooney to the base for runway 05. We were number three for landing reminding us that we weren’t at the sleepy little northwoods airport anymore. This landing, like the the one at RCX, was not bad considering the year off. We taxied up to the hanger door and shut down. The Hobbs showed 5.9 hours – 4.9 was mine and 1 hour was Mom’s. All-in-all, it was a great day . I got back into the air and learned a lot about the G1000. 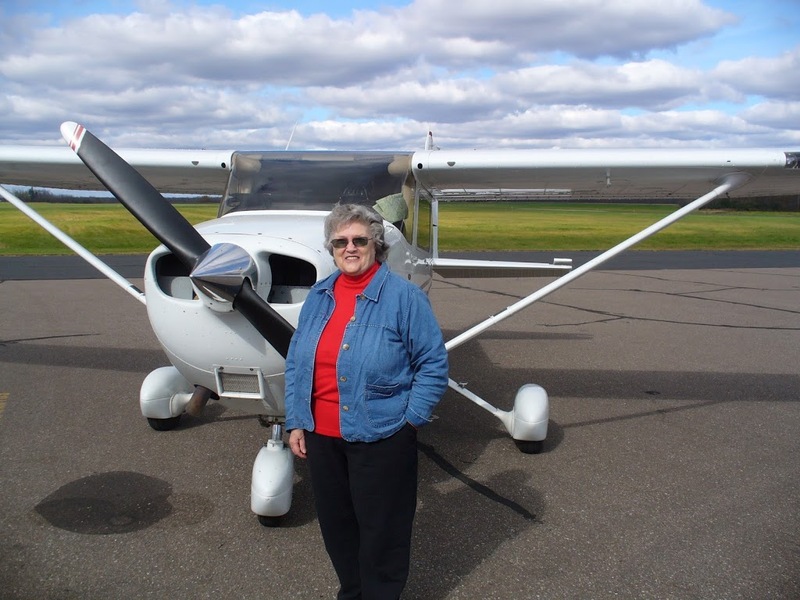 My mother got to fly an airplane on the day before she turned 78. I don’t think I could have chosen of a better way to get back into flying after a long layoff.